Opening Tuesday, October 18 at Equity Gallery, 6 pm to 8 pm. On view through October 29. Arielle de Saint Phalle curates a show of work by Andrew Gori and Ambre Kelly, founders of the SPRING/BREAK Art Show among other projects, curatorial and otherwise. For the first time, the two artists will be showing a series of collaborative photographs they’ve taken over the course of five years. 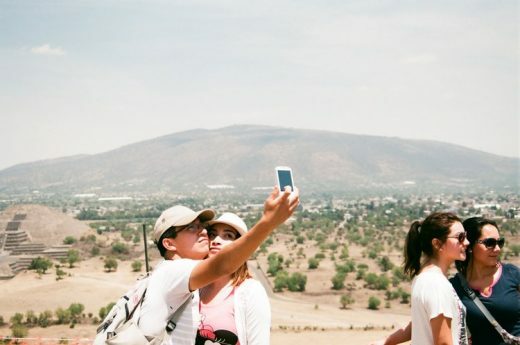 The photos are described as a chronicle of “the self-portraiture practice of travelers and tourists,” which is essentially a fancy way to say you’re taking pix of people taking selfies in various locations. Not that there’s anything wrong with that. As selfies have become more and more ubiquitous throughout the world, a documentation of how people take them, especially in international travel hubs and beyond, sounds certainly intriguing. Sure, it’s definitely a little weird and voyeuristic to be showing them in a fine art space, but I suppose it’s just a more permanent form of people-watching. In stark constrast to the high-tech smartphone, which is prime vehicle for selfies, all of the photos on display were taken with 20th Century prosumer film cameras. So no, that’s not just a vintage Instagram filter.